In this collection of essays and recipes, Alice Waters showcases the simple building-block ingredients she uses to create gratifying, impromptu meals all year long. 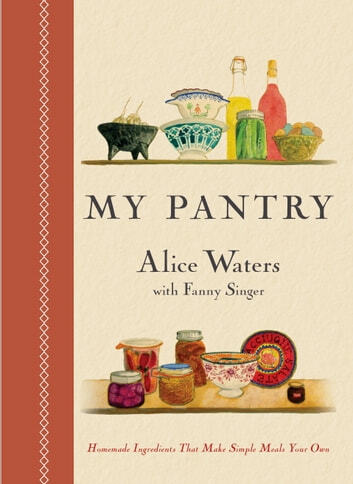 In her most intimate and compelling cookbook yet, Alice invites readers to step not into the kitchen at Chez Panisse, but into her own, sharing how she shops, stores, and prepares the pantry staples and preserves that form the core of her daily meals. 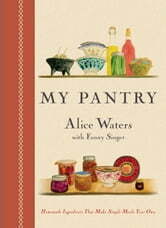 Ranging from essentials like homemade chicken stock, red wine vinegar, and tomato sauce to the unique artisanal provisions that embody Alice’s unadorned yet delightful cooking style, she shows how she injects even simple meals with nuanced flavor and seasonal touches year-round. From fresh cheeses to quick pickles to sweets and spirits, these often-used ingredients are, as she explains, the key to kitchen spontaneity when combined with simple grains, vegetables, and other staple items. With charming pen-and-ink illustrations by her daughter, Fanny and Alice’s warm, inviting tone, the latest book from our most influential proponent of simple, organic cooking ensures a gracious, healthy meal is always within reach.